I try to find the best deals for my customers and networking partners each year, so here are the best deals to grab this Black Friday (and things to avoid). As new ads get leaked I’ll update this post, so check back thru the coming week for updates. Walmart has the best deal I’ve seen so far is a 65″ 4K TCL with built-in Roku for ONLY $398. In case you haven’t heard of TCL don’t worry, it’s actually a very highly rated TV with some of the best feedback on Amazon. It’s my go-to recommendation for any customer looking for great bang for their buck. They also have a 55″ Hisense with Roku for $248 and a 40″ Hisense non-smart TV for $99. 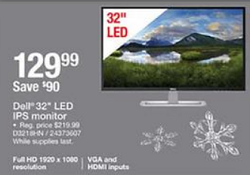 Last year we thought a 32″ for under $100 was a steal so these deals are amazing. Looking for a huge TV? 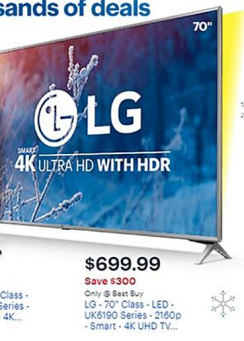 Best Buy has a 70″ LG 4K Smart TV for only $699. That lands squarely on the $10/inch mark I look for on premium brand TV deals. Instant Pots are super popular now and they’re also on sale nearly everywhere. It looks like Walmart has the best deal though at only $59. Keep an eye out for Amazon though because they did a lightning deal on them last year for $40. Kohl’s has a great deal on two different immersion blenders, with one for only $5 after rebate! And it’s not just the hand blenders on sale. Check out this page for all the $5 appliance deals at Kohl’s. 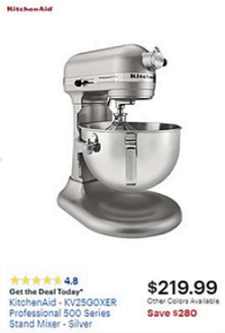 Best Buy is going to have a KitchenAid stand mixer for $219 ($280 off). Belk is also offering an entire selection of Bella appliances for $7.99 after rebate; the most notable being a toaster oven. The best deal on an air fryer is at JCPenny. $4.99 after a $20 mail in rebate. They’re also offering a toaster oven at the same price. Xbox One S and PS4’s will be on sale pretty much everywhere for $199. Both will come with one game or another. However, the best deal I’ve seen so far is Kohl’s where they’re offering an additional $60 Kohl’s cash bonus. Bonuses like this are how you make your holiday budget stretch the farthest. GameStop is offering a $50 gift card with the purchase of any new gaming system. GameStop is also offering Xbox Live subscription cards for $10 off. Also at GameStop is the Seagate 4TB Xbox One Game Drive for $99 ($60 off). If your TV is lacking in the sound department, Target will be running this Samsung Soundbar with wireless subwoofer for $119 ($80 off). If you’re looking for portable storage Best Buy has a great combo deal on a Western Digital 4TB hard drive with a 32GB thumb drive for only $79.99 ($120 off). Best Buy also has a 120GB USB 3.0 thumb drive for $18.99 ($61 off). If you need an upgrade to your workstation or home office Staples has a 32″ Dell computer monitor for $129 ($90 off). Staples also has a Brother Laser Printer for $49 (50% off). Staples also has a selection of printers and projectors which offer up to an additional $50 savings if you trade in your old equipment. If you want Roku but don’t need a whole new TV don’t worry. Roku Ultra 4K is going to be on sale pretty much everywhere for $48 (50% off). However, Walmart is the best place to pick one up because they’re throwing in a package of streaming credits worth over $50 including Sling TV, Vudu, and Showtime. Best Buy also has a deal on a Roku Stick for $29.99 ($20 off). Another good deal at Best Buy is their select offerings of $7.99 4K Blu Ray movies. These are generally $30 or more. They also have standard Blu Ray movies as low as $3.99. Sometimes retailers have price agreements with manufacturers which prohibit them from offering a discount on the item itself. Instead retailers will make special packages or offers if you buy the item from them. 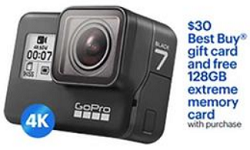 This is the case with Best Buy and the GoPro HERO7 for $399. It’s the same price it always is, but BB is offering a $30 gift card and a free 128GB memory card with purchase. That’s a solid deal if you’re looking to be the star of your own action film. It’s important to do your research before you head out on Black Friday because not everything the stores claim is a “door buster” is actually a good deal. PowerBeats by Dre are a great example. They retail for $199. 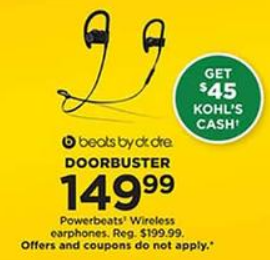 Kohl’s is offering them for $149 and giving $45 Kohl’s cash as an incentive to buy. Target has the same ones for $89 with no strings attached. However neither of these “deals” is better than the current ebay price of $75 with free shipping. And yes, that’s new, not used. 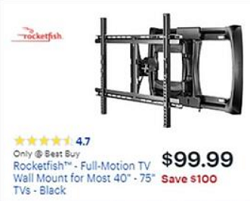 Another example: Best Buy’s Rocketfish TV Brackets. As far as quality, they’re fine, I can’t say anything bad about them. That price though… a full motion TV mounting bracket for 40″-75″ TV’s for $99 ($100 off). $100 is reasonable, but we can sell you a full motion bracket for $75, and our prices include tax. In fact, we’ll give you $25 off that price if we’re mounting the TV for you. Also at Best Buy is a 4ft HDMI cable for $9.99 ($20 off). Not only is this not a good deal, but at the original $29.99 it’s almost criminal. Retailers make loads of money on accessories like cables and brackets. At Install Heroes we charge $1/ft for HDMI cables no matter the length. For more information about why expensive HDMI cables are a waste of good money check out this article on MUO. Conn’s really should be more wary of making deals look better than they actually are considering their name is already what we use to convey an abuse of confidence. That hasn’t stopped them from inflating the value of deal they’re offering on an HP laptop this Black Friday. It’s a 15.6″ touchscreen i5 laptop with 8GB of RAM and a 1TB hard drive for $399. It’s actually not a bad deal. The problem comes when they claim that it’s a savings of $600. A laptop with those specs for $1000 is a rip off, and any claim that suggests it’s worth $1000 is a scam. Just to compare; the computer I’m writing this post on right now is an i7 convertible touchscreen with 12GB of RAM, a 1TB hard drive, and a 128GB SSD but it only cost $1100… two years ago. This is just another example of the importance of doing your research and having a pro that you trust to answer questions. Install Heroes always offers free advice, so feel free to contact us about any electronics you’re considering for purchase. We’ll be happy to consult with you about your needs and whether the item your considering will meet them.